Dental Implants Temecula | Dr. Parul Mehta DDS. Are you missing one or more teeth? Dental implants is the best treatment option for missing teeth. When you are looking for an implant dentist in Temecula consider a few factors before you make a decision. Dental implants are viable solutions for anyone who have broken, decayed, loose, or missing teeth. Instead of using removable dentures, why not enjoy permanent dental implants. Dr. Mehta & Associates offers long-lasting and reliable dental implants that have the natural look and feel of permanent teeth. Our extensive background in implant dentistry is augmented by our continual education in this ever expanding field. We utilize the latest dental advancements that allow patients to experience virtually no downtime after procedures. Our patients will see the immediate effects of new implants and some can even enjoy a light meal shortly after their procedure. Dr. Mehta & Associates has served the communities of Riverside, and Temecula continually for many years. Durability – If care for correctly, dental implants can last for several years. Comfort & Appearance – Implants are the closest substitute for natural teeth. There is no slurring of speech, slippage, or awkward look that is often apparent with dentures. Eating is performed naturally and confidently because each implant perform just like natural teeth. Convenience – Cleaning and care for implants is handled when you brush and floss. Since they are permanent there is no hassle with removal, cleaning, and adhesives. Our dentist team will help you to determine if dental implants are the best option for you. 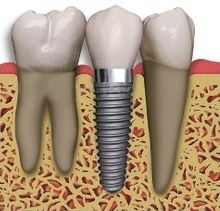 The comfort of a dental implant is contingent on the quality of the material used and the skill of the dentist. Therefore, our dental team uses the best dental products available and have expert training in dental implant procedures. Before moving ahead with any treatment, we’ll fully explain all of the options available to you and the reason why we recommend particular treatments. Dr. Mehta & Associates is highly recognized throughout Murrieta, Riverside, and Temecula. Visit any of our offices or click here to take a Google 360 tour of our facilities. At any of the offices of Dr. Mehta you can be assured that you will receive the highest standard of dental care. No one should have to suffer through daily oral pain, problems eating, or feelings self-consciousness due to dental problems. If you are dealing with any of these issues, allow us to help. Dr. Mehta & Associates is a fully dedicated team of passionate dentists who specialize in innovative dental treatments. Are you ready to get your dental health and appearance back on track? We are. Give us a call so that we can help.